I try to write rich, intense, rewarding, expressive music reflecting my various music theory and performance interests as well as love of nature, literature and my explorations in aesthetics and East Asian culture and spirituality. Random Audio Sample: Light, snow, suicide : for solo piano by Brad Gill, from the CD Sideband. 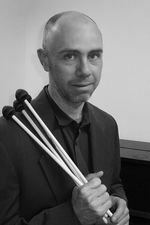 Brad Gill (1976) is a composer, percussionist and co-artistic director of the composer-performer collective Sideband as well as member of the experimental improvisation project 'Mind on Fire'. He began serious musical studies with a focus on xylophone and percussion, later developing an interest in composition, which he explored while a student at the Sydney Conservatorium of Music (from which he has an Honours degree and Ph.D.) and University of Western Australia. During this time he developed an interest in non-Western music, undertaking additional study in Javanese Gamelan and Tabla, as well as studying jazz, resulting in a broad and highly individual compositional and performance style. He has written for a wide range of music ensembles, from symphony orchestra to solo piano, with a focus on music for percussion and voice. Brad's focus is on experimentation with rhythmic and formal elements, and microtonal harmony as well as incorporating developments in atonal theory. His music has been commissioned or performed by a range of ensembles and soloists, including Daniel Herscovitch, Luminescence, Sideband, the Song Company, Ensemble Offspring, members of Elision, Western Australia Symphony Orchestra New Music Ensemble under Roger Smalley, Australian Piano Quartet, Kerry Yong, conductor Barry Webb, and the Sydney Conservatorium Percussion Ensemble. A number of works have been recorded for broadcast by the ABC. As a percussionist Brad has performed in a variety of ensembles, with a focus on participating in performances of his own music. Recently, the focus has increasingly been on performing, as a member of Sideband and in Mind on Fire, an improvisation based project with his brother, Sam Gill. He taught composition and music theory for fifteen years at the Sydney Conservatorium of Music (2000 to 2015), and is still occasionally engaged in casual lecturing. Like writing on water : for piano solo (2015) Commissioned by Daniel Herscovitch.